In the imaginations of its boosters, and for many outside the state, California is often seen as the role model for the future. But, sadly, California is also moving backward toward a more feudal society. Feudalism was about the concentration of wealth and power in a relative handful of people. Historically, California created fortunes for a few, but remained a society with enormous opportunity for outsiders, whether from other states or countries. One of Pat Brown’s biographers, Ethan Rarick, described his leadership as having made the 20th century into “The California Century,” with our state providing “the template of American life.” There was an American Dream across the nation, he noted, but here we had the California Dream. This proud legacy is threatened, as we point out in our study to be released Monday. Today California is creating a feudalized society characterized by the ultra-rich, a diminishing middle class and a large, rising segment of the population that is in or near poverty. Overall our state now suffers one of the highest GINI rates — the ratio between the wealthiest and the poorest — among the states, and the inequality is growing faster than in almost any state outside the Northeast, notes liberal economist James Galbraith. The state’s level of inequality now is higher than that of Mexico, and closer to that of Central American banana republics like Guatemala and Honduras than it is to developed states like Canada and Norway. California, adjusted for costs, has the overall highest poverty rate in the country, according to the United States Census Bureau. A recent United Way study showed that close to one in three of the state’s families are barely able to pay their bills. Overall, 8 million Californians live in poverty, including 2 million children, a number that according to a recent report, has risen since the Great Recession, despite the boom. California’s poverty, and the loss of a middle class, is most profoundly felt in the interior counties. California, according to the American community survey, is home to a remarkable 77 of the country’s 297 most “economically challenged ” cities, utilizing a scoring of poverty and employment data by the National Resource Network. Los Angeles, by far the state’s largest metropolitan area, has among the highest poverty rate of largest U.S. metros. Even in the Bay Area the current boom is creating what the Japanese philosopher Taichi Sakaiya has called “high-tech feudalism.” In the last decade, according to the Brookings Institution, among the nation’s large cities inequality grew most rapidly in San Francisco; Sacramento ranked fourth. In this dispiriting election year, no prominent California politician, left or right, has addressed seriously the collapse of the state’s dream of upwardly mobility. A problem this complex can’t be addressed by the party bromides — lower taxes by conservatives and more subsidies by progressives. The real problems lie with policies that keep housing prices high, an education system that is a disgrace, particularly for the poor, and a business climate so over-regulated that jobs can be created either in very elite sectors or in lower-paying service professions. Even in the Bay Area in coming decades regional agencies predict only one in five new jobs will be middle income; the rest will be at the lower end. Of course, this increasingly class-bound society could survive, as long as the economy stays on an even keel, so that the rich can pay the bulk of taxes. But this feudal California is neither economically or socially sustainable over the long term. A recent poll found that only 17 percent of Californians believe the state’s current generation is doing better than previous ones. More than 50 percent thought 18-30-year-old Californians were doing worse. Our research finds that a large percentage of Californians have virtually no discretionary money available, after taxes and reasonable living expenses are taken into consideration. This situation should be unacceptable no matter what one’s politics. There is no reason why Californians need to endure a crumbling infrastructure, pay outlandish housing and energy prices while paying high taxes, all to maintain an education system that is failing all too often. Rather than posture and scream, it would be better if California’s leaders focused instead on what is happening to our state and address aggressively the prospects for improving things for the next generation. 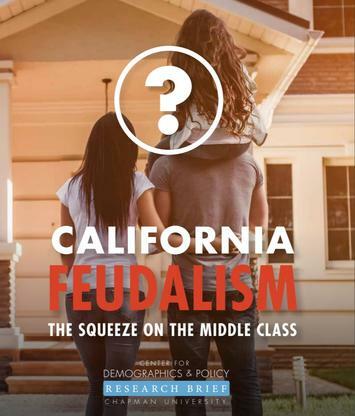 Read "California Feudalism: The Squeeze on the Middle Class" here. Marshall Toplansky is Clinical Assistant Professor of Management Science at Chapman University. He is co-principal investigator, with Joel Kotkin on “The Orange County Model”, a demographic and econometric research project to identify growth strategies for that region. He is formerly Managing Director of KPMG’s national center of excellence in data and analytics, and is co-founder of Wise Window, a pioneer in sentiment analysis and the use of big data for predictive models. He lives in Orange, California. Can California Transition to Next Tech Wave?